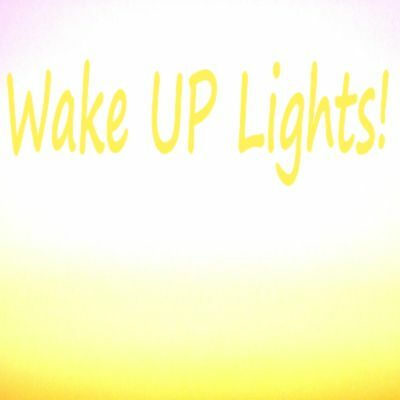 Wake Up Alarm Lights Philips, Nature Bright...| No 1 is HOT! There are several options when looking for a wake-up light also known as dawn simulator. You could also say a natural sunrise alarm clock. I try to help you by researching the various devices, so you can choose the one suitable for you. My selection below may give you a rough idea about differences between a brand or model vs another. I think it is a nicely designed Colored and White Philips HF3520/60 Wake-Up Light. Light duration - max. 300 Lux - can be set between 20 minutes and 40 minutes in order to simulate dawn. It's effectiveness has been clinically proven. Equipped with FM radio, 5 wake-up nature sounds, 2 alarms. Nonetheless you can set the sound to zero, then there's no sound at all. You can also use this light to get asleep. Rating: Great and many, many users. See Amazon Here for this really popular wake up light. Light and sound gradually increase so you wake up bit by bit. Light increases for 30 minutes before want to get up. You can set a natural sound or the radio to let yo wake up. See Amazon Here for this Philips Wake Up Light. Unique design, this White Lumie Dawn Simulator Wake Up Light Active 250 model NLT-250. Light source is a 42 watt halogen bulb with 630 Lumen brightness. This multipurpose device features sunset option, FM radio, nightlight and security option to turn light on while away. To wake up naturally you can set the light for 15, 20, 30, 45, 60 or 90 minutes. This light can also be used as a bedside light. See Amazon Here for the Lumie dawn simulator alarm. Quite suitable for traveling, this Portable 2-in-1 Nature Bright Sun Bliss Light Therapy and Wake-Up Light. The light produces 10,000 Lux for light therapy for say 30 minutes a day. The wake-up feature wakes you up naturally by gradually increasing the light. See Amazon Here for the NatureBright wake up light. Nicely shaped White and Colored Medisana Wake Up Light Wl 450, model 45105. In fact this is an European device (Germany), but is supplied with an electric plug adapter to use in the USA. Features radio, MP3 connection, snooze function and 2 adjustable alarms. The light is energy-efficient LED and gradually increases for 30 minutes before your wake up. To awake you can choose from 7 colors and 8 natural sounds, both with increasing volume. See Amazon Here for this Wake Up Light. Yes, you probably could wait for it. And now it is there. The newly developed wake-up clock that spreads your favorite smell that will wake you up, assures the developer. So you experience a soft and an enjoyable wake-up. Even, when you are a a big sleeper, an early riser or a late-to-bedder. The power of our stimulant smells will wake you up, he says. The developer of this olfactory wake-up clock happens to be a young French engineering student who doesn't like the alarm clock going off in the morning. He and his team succeeded in raising enough money to develop this new wake-up device. It even won already awards for their innovation. The system - dimensions in inches: 3.5 (Length) 3.5 (Width) 3.9 (Depth) - works with smell capsules, releasing the smell gradually after the set time. You can program for in case after 3 minutes the off button hasn't been hit, the alarm will be heard. Each capsule can be used 30 times. The aromas that become available are: Chocolate, Peppermint, Cut grass, Sea, Croissant and Espresso. The retail price is indicated at $109 - and when it will be available? Probably in the course of 2016. If you want to go for a pre-order - price $89 - you do so at the Sensorwake website. Here's the "What smell would you wake up to" poll. 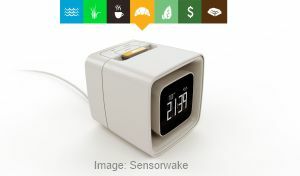 It is indeed a nicely designed unique Gently and Peaceful Progression Wakeup Clock. It wakes you up gradually starting with glowing light and nature sounds. If you want it releases aroma scents of your choice. At the end of its procedure, a chime will be heard in case you did not awake. For the scents you can use your own aromatherapy oils or use the aroma beads: Ocean Water, Pear Vanilla, Lavender Essence, and Clean Cotton) - that come with the clock. If you're interested in scents dispersed by oil diffusers then look for information at Best Essential Oil Diffusers. A wake-up clock featuring bright light. Then there are wake up clocks equipped with a bright light to wake you up. 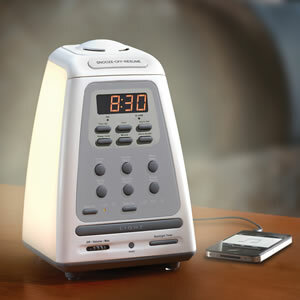 An example of such a wake-up clock is the Medisana Wake Up Light also featuring an alarm and a MP3 player connection. You can even choose to be waken up by your favorite light color or your favorite nature sound. See Here on Amazon for more info and best pricing of the Medisana Wake-Up Light with Alarm & MP3 player connection.